Tongue - Fibrosis in a male F344/N rat from a subchronic study. 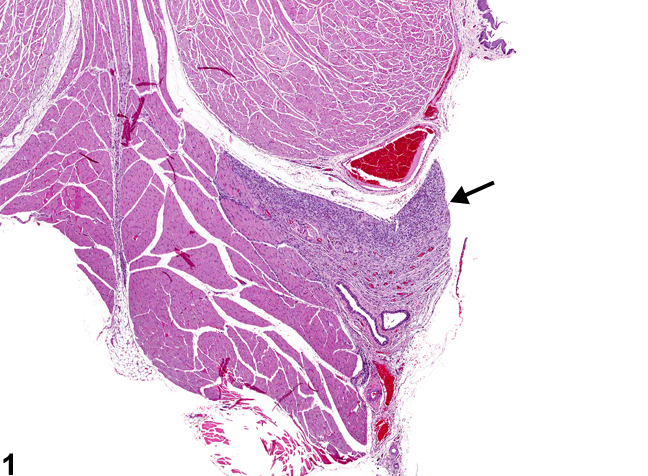 There is an area of fibrosis with associated inflammation in the tongue (arrow). 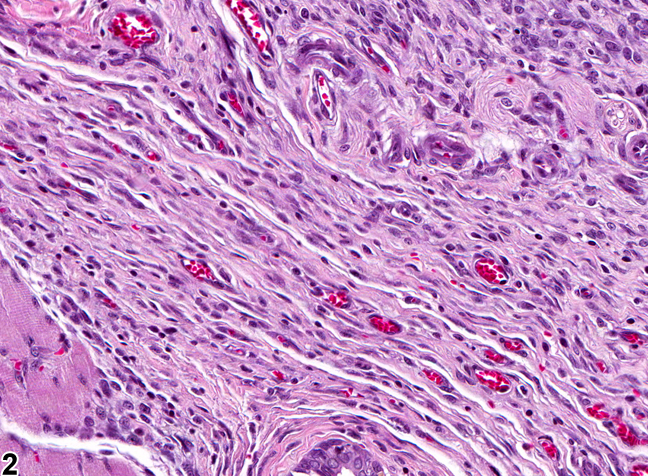 Tongue - Fibrosis in a male F344/N rat from a subchronic study (higher magnification of Figure 1). There is chronic inflammation and neovascularization within the area of fibrosis. Fibrosis ( Figure 1 and Figure 2 ) is characterized by an increase in fibroblasts and associated collagen and is usually a sequela of tissue damage. 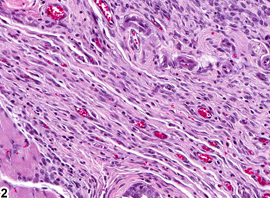 Fibrosis forms when there is necrosis of the tissue framework and the space is filled with fibrovascular tissue (granulation tissue), which is eventually replaced by mature connective tissue forming a scar. Fibrosis is often accompanied by inflammation, which may be chronic active early in the process but is often chronic. Fibrosis is also seen with abscesses where the body is attempting to wall off the inciting agent. 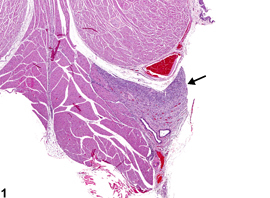 Fibrosis may be a treatment-related lesion but can also be an incidental finding. When it occurs in absence of other lesions, fibrosis should be diagnosed and graded. When it is a component of chronic inflammation, fibrosis should not be diagnosed separately unless it is particularly prominent or disproportionately severe relative to the severity of the inflammation, or if the pathologist feels it is an important lesion that needs to be highlighted. Associated lesions, if prominent, should be diagnosed separately (e.g., necrosis, inflammation). Ackermann MR. 2007. Chronic inflammation and wound healing. In: Pathologic Basis of Veterinary Disease, 4th ed (McGavin MD, Zachary JF, eds). Mosby, St Louis, MO, 101-152. Bertram TA, Markovits JE, Juliana MM. 1996. Non-proliferative lesions of the alimentary canal in rats GI-1. In: Guides for Toxicologic Pathology. STP/ARP/AFIP, Washington, DC, 1-16.